Don't Take Yes for an Answer! Yes men. Yes women. People who say Yes. Leaders who only want people to say Yes. There are countless decisions required to deliver projects and lead teams. We make the job significantly more difficult if we fall into the trap of surrounding ourselves with Yes people. Or shooting the messenger who brings bad news. Or any of the dozens of cognitive biases that can cloud our decision-making judgment. 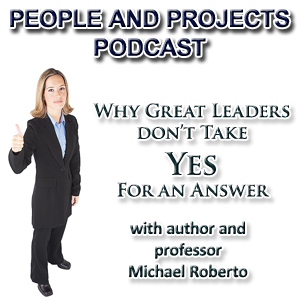 My guest today is author and professor Michael Roberto. Mike just released a second edition of his book on decision-making entitled Why Great Leaders Don't Take Yes for an Answer: Managing for Conflict and Consensus. When someone doesn't agree with you, is it just a disagreement that leads to a vigorous and healthy debate? Or, as far as you're concerned, they're just wrong? In this episode you'll hear how we can make better decisions through conflict and consensus. Follow Michael on his blog or check out his offerings at The Great Courses. IT'S NOT SO MUCH THAT I DISAGREE WITH YOU IT'S THAT YOU'RE WRONG by The Gentlemen is licensed under a Public Domain Mark 1.0 License. YES by Hecuba is licensed under a Attribution-NonCommercial-ShareAlike License.